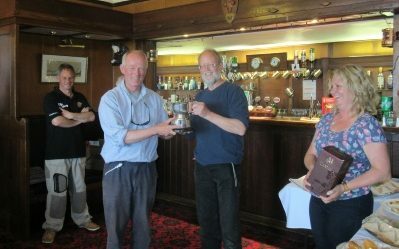 The scheduling of a visit by the Bristol Channel Pilot Cutter Association with the rediscovery of the BCYC Swansea Bay Regatta Cup that was last raced for in 1911, seemed a highly appropriate time to rededicate the Cup. Saturday saw 6 Pilot Cutters make the start line for races 2 & 3 of the Bristol Channel Pilot Cutter Association’s Swansea Bay Regatta. Race 1 being the passage race from Barry on Tuesday, 3rd May. Under Association rules, results are based on 1st across the Line. Tim Pratt of the PCA was Race Officer, assisted by Alyson Nicholson of BCYC. Saturday’s races were also race 1 & 2 of the BCYC/Swansea Museum Swansea Bay Regatta with races handicapped using Old Gaffa TCF handicapping. Alyson was Race Officer, kindly assisted by Tim. Race 1 was a scheduled round the cans in the Bay with finish line at SWIGG. Conditions were a sunny 15kt Easterly with Mascotte taking line honours. 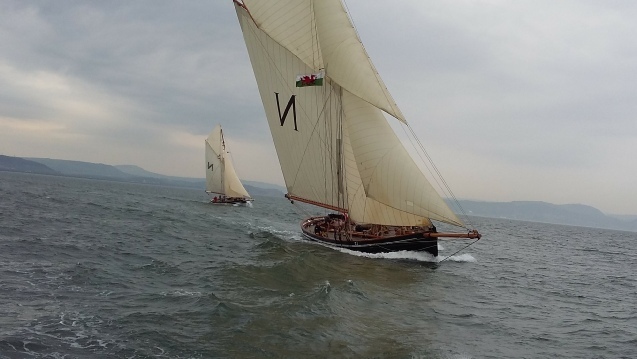 Race 2 was to be the long distance (4 hour) race that for the BCYC regatta, was for the Scarweather Bowl, alas the wind was dropped and by Pwll Du the fleet was mainly moving by tide only. The course was shortened to finish at Mid Fairway Gate. 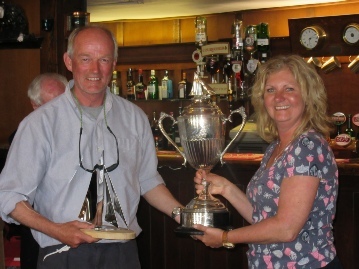 There was a “Pint and Curry Supper” on Saturday evening in BCYC preceded by the prize giving for the PCA series won by Mascotte, pictured ahead of Alpha. Due to unfortunate Tide times Peggy and Dolphin, the end runners from Saturday’s race chose not to compete as they would not be able to lock back in until late Sunday afternoon, and crews needed to travel Home. Race 3 of the BCYC regatta saw better wind and a highly contested start by Alpha, Olga and Mascotte with Jan Rorlan 7 minutes late. Beating over to Grounds, then Cabenda, saw Jan Rorlan erode the lead of the fleet and was forced to undertake Olga rather than risk being luffed, which resulted in a close quarter manoeuvre that found bow sprit missing flag pole by what seemed like 12 inches. Having dealt with Olga just before the upwind mark, Jan Rorlan continued to reel in Mascotte on the long run back to the finish line at SWIGG which saw the closest of finishes with Mascotte just sneaking the line ahead of Jan Rorlan by 1 second! Even allowing for handicapping Mascotte took a clean sweep, with Olga 2nd, Jan Rorlan 3rd Alpha 4th, and Dolphin and Peggy joint 5th overall. Alyson allowing Mark to touch the BCYC Swansea Bay Regatta Trophy, last raced for in 1911. 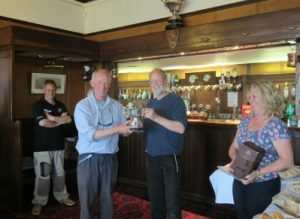 The cup was kindly returned to the club by descendants of the previous winner, and will now remain in the Club. In order to honour the recently departed Dr. Aubrey Hudson, race 2 of the BCYC regatta was to be the long distance race that encompassed Scarweather West cardinal and would thus carry its own trophy, the Scarweather Bowl, inaugurated by Dr. Hudson in the 1950’s. 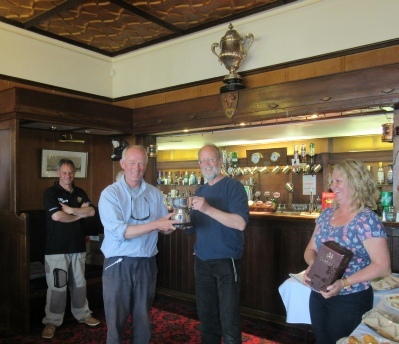 Unfortunately the decreasing wind necessitated a shortened course excluding the Scarweather buoy, however we were delighted that Dr. Hudson’s eldest son Rob, was kindly invited to crew on Swansea Museum’s Olga by Skipper Matthew Williams, and was on hand to present Mark, owner of winning Cutter, Mascotte with the Scarweather Bowl. Pictured from left, Matthew, Mark, Rob and Alyson.